AUSTIN, Texas, Nov. 2, 2017 /PRNewswire/ -- While holiday shopping madness can bring stress, it can also be one of the most thrilling times of the year—if you know where to shop and what to buy. Several categories hit their lowest discount prices during November, especially between Black Friday and Cyber Monday. But don't sleep through the rest of the month, because there are deals to be had every single day. Keep reading to find out what items to buy, where to buy them and what to wait on! As the most heavily shopped month of the year, November offers shoppers some of the deepest discounts on winter clothing, shoes and accessories. With Black Friday and Cyber Monday on the horizon, several retailers are making room for newer inventory and seasonal items. Historically, RetailMeNot has seen deals on Eddie Bauer, PacSun, Coach, UGG, Footlocker and Champs, along with many other well-known retailers. 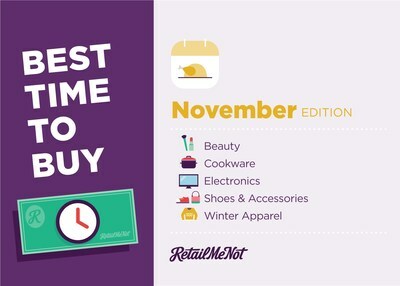 The best time to buy in these particular categories are the 10 days leading to Cyber Monday. Holiday gatherings and entertaining are taking center stage. So with the seasonal cheer comes the necessity to stock up on cookware and kitchen items. Thanksgiving and holiday sales offer the deepest and most frequent discounts in the coming weeks. Surprise your in-laws with your gifted cooking skills this year and score some savings at places like Sears, Bed Bath and Beyond, and JCPenney. Let the chaos of Black Friday and Cyber Monday commence! The craziest shopping holiday of the year brings the deepest discounts on large electronic purchases, from TV sets and cameras to phones and tablets. Shoppers will want to take advantage of these big-ticket items and get up to 40% off laptops, tablets and electronic accessories and more. A new season doesn't just signal a new wardrobe, it also calls for a full beauty revamp. Deep discounts are plentiful this whole month across many categories, but beauty has quite a few steals as well. Cosmetic stores will be making room for new holiday sets and seasonal product launches. And much like the clothing and accessories categories, retailers will want to clear the shelves to make room for new inventory. Hold off on any jewelry purchases until the new year. While jewelry is a hot-ticket item for the holidays, January brings savings in the form of Valentine's Day discounts. Toys are not usually at their lowest price point during November. Retailers create a sense of urgency to purchase new toy arrivals early, because hot items may not be available later on, but the best deals typically occur during the first two weeks of December.